Thank you to HoMedics for sending products in exchange for my honest opinion in this review. Who isn’t looking for more relaxation in their life? This holiday season HoMedics has some wonderful options for gifts that provide relaxation for the recipient. 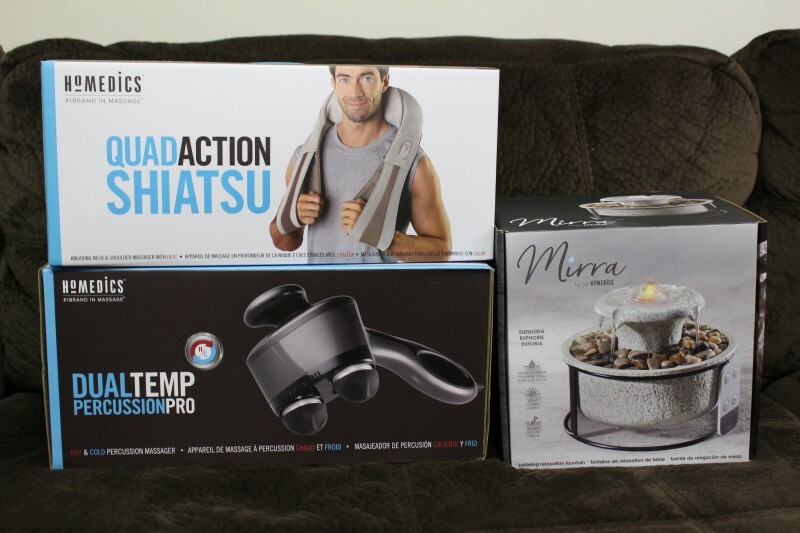 I received the Quad Action Shiatsu Kneading Neck & Shoulder Massager With Heat, the Dual Temp Percussion Pro Hot & Cold Massager and the Mirra Euphoria Tabletop Relaxation Fountain for review. 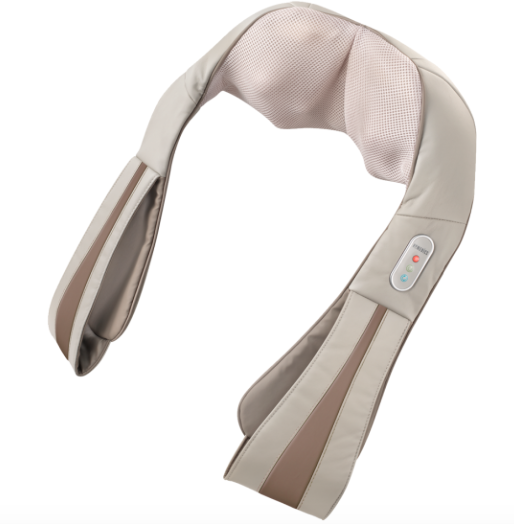 The Quad Action Shiatsu Kneading Neck & Shoulder Massager With Heat (shown above) provides deep kneading shiatsu massaging to loosen tight muscles. My husband and I both appreciate that this massager can be used on your own without the assistance of someone else. You can choose between a deep kneading shiatsu massage, a soothing vibration massage or a combination of both. There are three speed settings that allow you to control the intensity of your massage. You can also choose to add heat for a more relaxing massage. 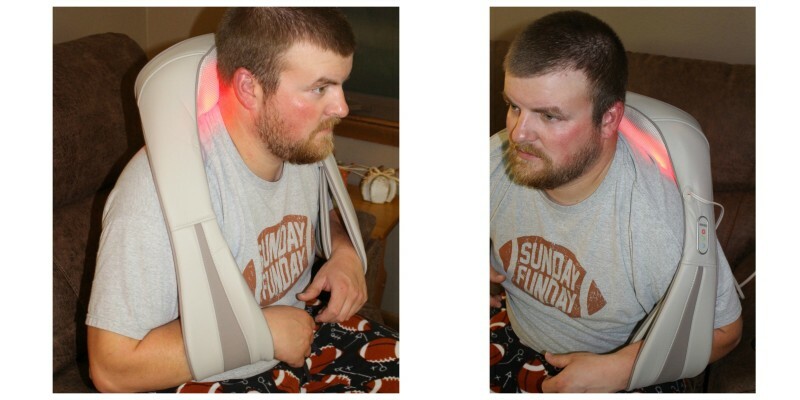 My husband is a farmer and he often complains of tight neck and shoulder muscles so this was a welcome addition to our home. He uses it often at night while sitting on the couch watching TV and relaxing. He really enjoys it. We also received the HoMedics Dual Temp Percussion Pro Hot & Cold Massager (pictured above and below). 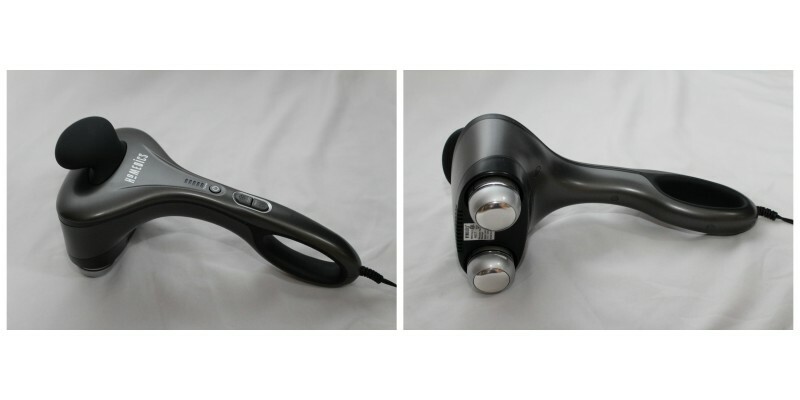 This massager features hot and cold settings to help enhance your massage experience. 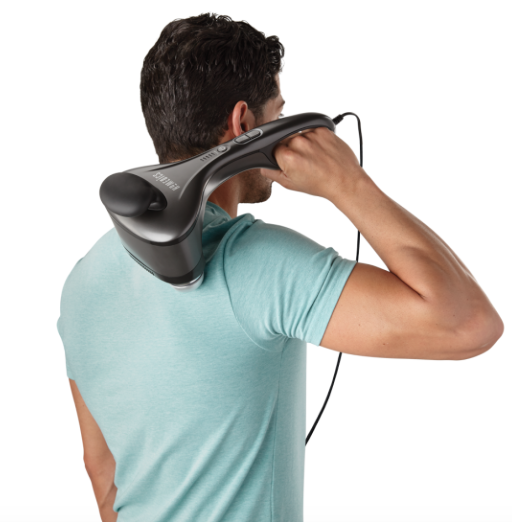 The dual head delivers a deep, targeted massage. It comes with three interchangeable massage nodes so the massage can be customized even further. Again, my husband and I appreciate that this massager can be used on your own. Should you want an area massaged that is a little harder to get to (low back?) then another person can easily run the massager. It has an ergonomic handle and is very easy to maneuver. Finally, I received the Mirra Euphoria Tabletop Relaxation Fountain. I originally was thinking about using this fountain in my office at work, but I set it up at home in the bathroom and am really enjoying it here. Time will tell if I bring it to work when I return from my maternity leave! The Mirra Fountain uses natural water sounds to help relax you. It has a soft light/glow at the top to help increase the ambiance. It measures 7.5 by 7.5 by 6.75 inches, so it is the right size for use on the bathroom countertop or a desk at work. The Mirra also optionally plays soothing music, which can be controlled by a remote control. The only critique I have about the Mirra is I wish It would have come with more stones. In the pictures on the box and online it looks like there are a couple layers of stones, and mine barely came with enough to cover the stone area in one layer. Other than that I am pleased with the fountain. Do you have anyone on your holiday shopping list that might like one of these items from HoMedics? Buy It: Head over to HoMedics to see for yourself the great selection of products they offer. Connect: Don’t forget to like them on Facebook, follow them on Twitter, Pinterest, Instagram and YouTube for all the latest news and promotions. 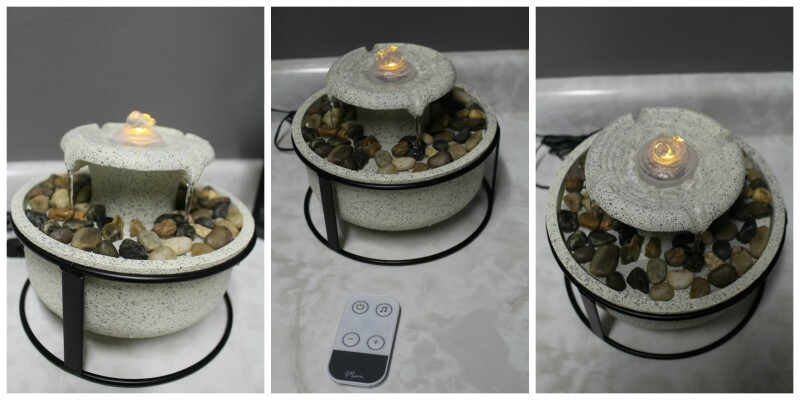 I really love the Mirra Euphoria Tabletop Relaxation Fountain. It is so pretty! These are definitely fantastic gift ideas! I know a lot of people that need to relax and would love to have one of these products. Thank you so much for sharing! I love the Quad Action Shiatsu Kneading Neck & Shoulder Massager With Heat. We both have neck pain and this would really help. I didn’t know they made them like this. We have a Homedics seat for our chair and we love it. Their products last a long time, now I have something else I can get my husband for Christmas (and I can use it too). I work in the garden and the farm every day so I would love that neck and shoulder massager! This company has some wonderful products. My husband works outside every day lifting and laying bricks and I work for USPS and some of the mail can get very heavy so we both have aching muscles and joints when we get home. These would be awesome for us both. I LOVE the table fountain. A water feature might be nice! The water fountain sounds like it would be relaxing. I love water fountains as they are so comforting, with the sound of water running. The Mirra Euphoria Tabletop Relaxation Fountain would be great to own and place in my office.